(08-05-2016 03:11 PM)Ayreonaut Wrote: Thank you. Life always throws up and downs and it's important to just keep pushing forward. I'll be fine, it's just a rough patch In time. And the front to rear swap is actually for the coil springs, because they are the same width. If you put the front coils in the rear, it will net about 3-4" of lift, and then you just need to buy front lifted coils to match, and shocks and all the other associated stuff. I might do that, but for not a lot of extra money I could get a complete 4.5" lift that would raise me higher, and replace my soft riding 20 year old springs with something better. I've noticed that when I have my jeep fully loaded the rear does sag a little bit. Relationships are overrated. Better to invest in the hobby we have it returns more smiles. That's the reason I have stuck to it, i have met some awesome people on and off the trails and have made a lifetimes worth of smiles and will continue to do so. Had a blast down in PA. It's so nice to get away sometimes. The jeep handled the 800+ mile trip with no issues at all. I have to remember to take pictures of the camping setup make in it, it works extremely well. Still saving/searching for tires and a case, but I did get a set of 1.25" wheel spacers so that I can turn at full lock again without rubbing, and without having to sacrifice the turbine wheels. The tires don't stick out too much, but that's exactly how I wanted it. It's probably the right call on the spacers if it was enough to get your steering to full range without going too wide and giving her the leverage to snap off some expensive bits! My only legitimate complaint is they're a little difficult to balance so I had to BB balance them and they get a little wobbly at 80 mph on the highway. But really, what can you expect from beefy MTs like that? (08-22-2016 08:10 PM)Ayreonaut Wrote: Had a blast down in PA. It's so nice to get away sometimes. The jeep handled the 800+ mile trip with no issues at all. Nice rig, I'm digging the Lab sticker. 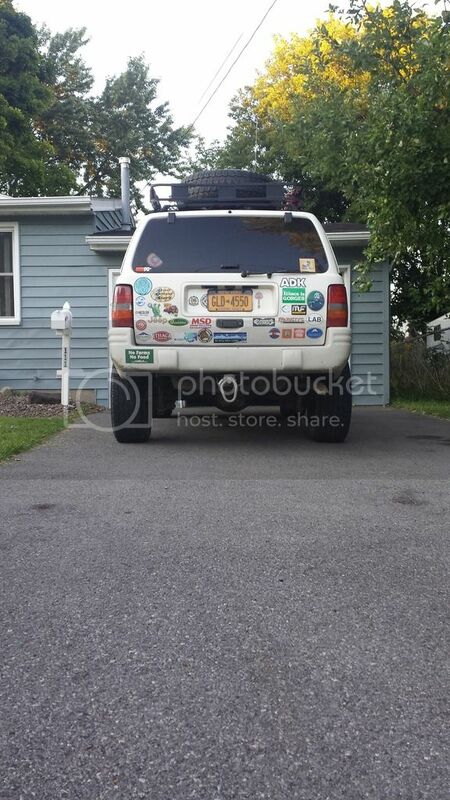 I was curious to see what ur SUV looked like. i spent a lot of time down there as a teenager. havent gone too much recently, unfortunately. my jeep did awesome up at scotts place. managed to do some body modifications to the rear drivers door and quarter panel trying to squeeze through some tight spots... looks like ill be trimming my fenders up and i want to get some rear quarter panel armor now too. (09-04-2016 10:48 AM)Ayreonaut Wrote: thanks man! DANG!! I just checked the vid and looked like a ton of fun. Scratches I don't mind but dents I'm interested in seeing what kinda of rqp armor design you think would help. LAB is where I learned to love winter!! Gotta get out back on snow man. I managed to acquire some fresh dents on my front fender at Scott's last weekend. Turns out you can buy replacement fenders for like 40$ online, so I'll be getting probably a set and trimming the wheel wells up. I managed to get my rear wells cut and folded up for more tire clearance. I'd like to get a set of 32s under it. Also took off my bull bar, I was sick of it getting caught up off road and I smashed out one of the hellas on the trail anyways. While I was in there I was finally able to get my broken tow hook bracket off and I sent it to back to Rustys to get a warrantied one. Finally got myself a 231 transfer case and I even got the correct shift bezel out of a 93 zj at the junkyard! 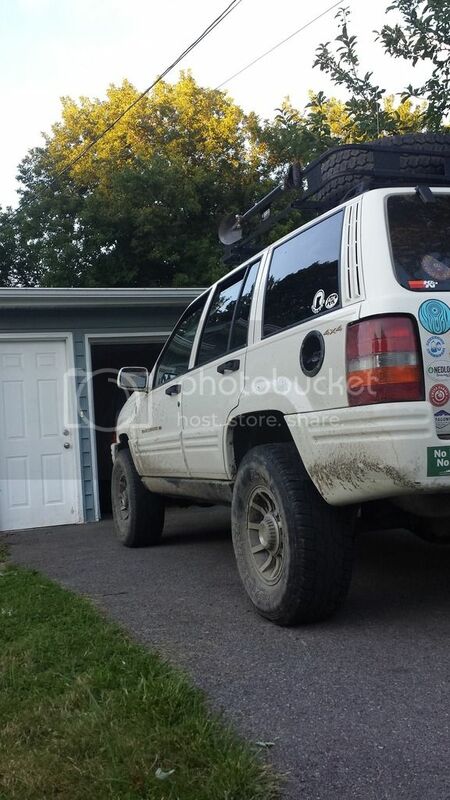 I also mounted a set of KC daylighters on my roof rack, and I moved the one remaining Hella in between them. 800 miles one way, I figure I'll probably get at least 2-300 miles of driving around in the mountains and state, and 800 miles back home.